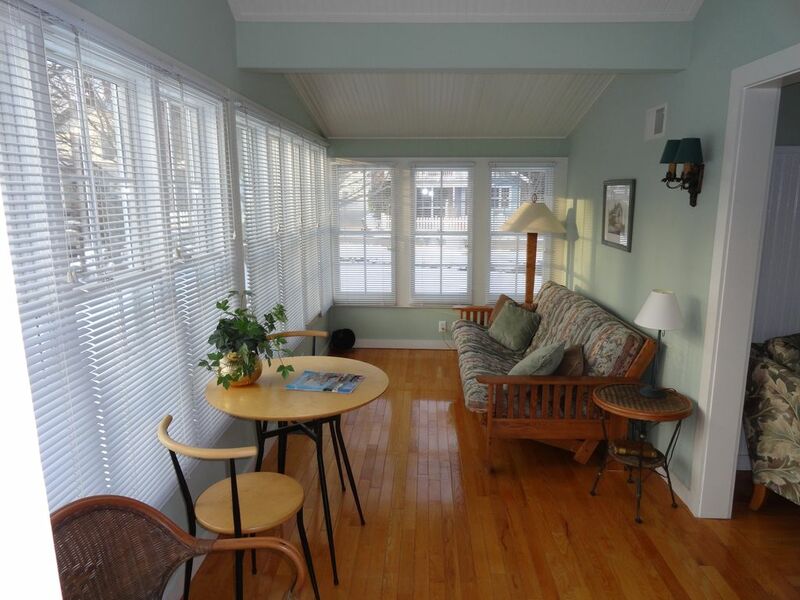 Enjoy the quiet surroundings of the historic Singapore cottage, located two short blocks from beautiful downtown Saugatuck. With accommodations for four, the cottage features the conveniences of home, in a charming cottage atmosphere. Dating from the late 1800's, the original structure is believed to have been an ice storage house from Singapore, Michigan. Singapore was located on the Kalamazoo River near the present day Oval Beach. The shifting sands along the shore were a constant threat to the village and many structures were relocated to Saugatuck. With wall to wall windows on three sides, the Sun Room features a full-sized futon, breakfast table and wicker bench. It is a wonderful place to nap, read a good book or enjoy a gentle breeze from the open windows or ceiling fan (central air conditioning included). With four comfortable chairs, the Entertainment Room features cable television, DVD and audio system. The room layout is perfect for socializing with friends or family. A fully furnished kitchen awaits your cooking adventures. Complete with service for four, the kitchen features a gas oven/range, microwave, coffee maker, toaster and large refrigerator. For your outdoor cooking, a Weber grill is available. The bathroom maintains the cottage charm with beaded board wainscoting and ceiling. Also, the tiled floor and shower offer whimsical tile insets. A queen-sized bed provides a restful nights sleep or an afternoon nap. The full-sized futon provides the additional sleeping accomodations. You're going to read a lot of reviews about how this cottage is clean, convenient, and stylish. You're going to read a lot of reviews about how John and Rob are going to wreck the curve for VRBO hosts (they are remarkable)! You can be sure that what others wrote about Singapore Cottage is a matter of fact and is all true. My wife and I came here to celebrate our tenth anniversary and Singapore Cottage was perfect. We came here from Detroit to explore the area, but the weather turned cold and rainy (this is what happens when you get married in October), so we spent more time indoors then we planned. The cottage turned out to be our favorite place from our weeklong vacation in Saugatuck. We enjoyed just hanging out there for hours at a time. No kids. No noise. No toys. We ate. We read aloud to each other. We laughed. We talked. We RELAXED! It was a place we just really enjoyed together. We could feel ourselves finding ourselves again! Over ten years of marriage, we've stayed a lot of places all over the country. This one is our favorite. Reading the guestbook (entries go back several years), you can see that a lot of people have left a little of their own good times and happiness behind at Singapore Cottage. The place is saturated with magic. Want to feel a little magic? This is the place to stay when you're in Saugatuck. The Singapore Cottage is cozy chic in it's perfectly Saugatuck way. It has everything you would need, perfectly appointed and in an ideal location. I stayed one day by myself and found it to be a relaxing, meditative space with wonderful light in the reading room and serene garden fountain off the porch. My family joined the next day and the space suited our family of four perfectly for the weekend. Our hosts, Rob and John, thought of everything to make our stay comfortable...and if there is anything else you need they are available and responsive and super happy to accommodate. We enjoyed our stayed. Easy to walk downtown from the cottage and we enjoyes our moening coffee in the front room. The cottage is perfectly sized for a couple and even for a couple and two more. We loved this place! Highly recommend! Wonderful stay. Clean, beautiful property. Very welcoming hosts and great time! Wonderful, well located cottage. Owners are very friendly and accommodating! We will return!